Forest City was under a considerable amount of pressure when it first started due to the knee-jerk reactions of some environmentalists and half-baked as well as over-ripe politicians seeking quick publicity to remain relevant. While the environmental concerns have been addressed and continues to be addressed as the project progresses, it is notable that the political concerns seem to originate only from the Malay politicians. It seems that the Chinese politicians realise the potential this development brings. Almost, if not all the issues have been addressed in a recent posting of mine on the matter, but it seems that these politicians are hell bent on flogging an already decomposing horse. In the meantime, Forest City continues to develop and progress, in very notable ways. 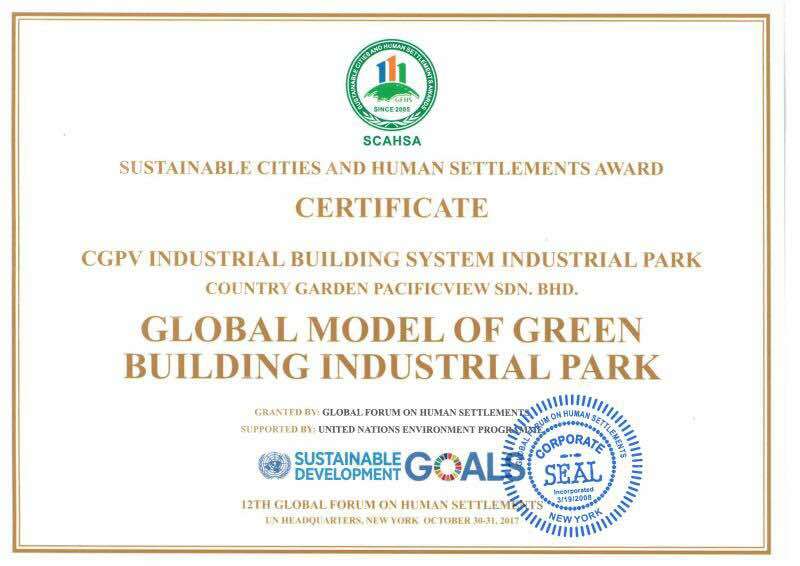 On the 31st October 2017, Forest City won the Global Model of Green Building Industrial Park for the second consecutive year. The award was part of the Sustainable Cities and Human Settlements Award (SCAHSA) ceremony held in New York. The SCAHSA award established by the Global Forum on Human Settlement (GFHS), a non-profit organisation with Special Consultative Status within the United Nations Economic and Social Council (ECOSOC). It is a trend setter for urban construction everywhere that respects sustainable development. Forest City, China’s Wuyi County and Indonesia’s Surabaya City were among the winning entries submitted from 23 countries and regions worldwide. 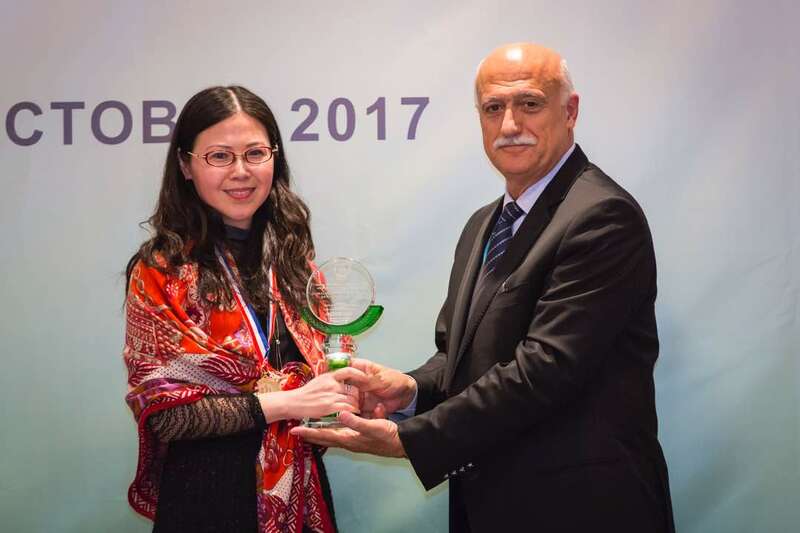 Forest City won the SCAHSA Global Human Settlements Award on Planning and Design at the 11th Global Forum on Human Settlements (GFHS – XI). Forest City, by taking full advantage of its technical resources, is creating a 1.7-square-kilometer construction-focused industrial park, to promote the development of a green building industry and improve building precision and quality, said Dr. Wang Jiying, vice general manager for overseas business at Country Garden. Forest City will include several support facilities and a powerful water transportation system, all of which are expected to be operational in 2019, with the aim of creating a truly industrialised manufacturing base for the construction industry over the next three to five years. A month and a half ago when I was at Forest City, I was brought to visit one of five schools adopted by Forest City where children are given free Mandarin lessons for three months. This is one of the ways by Forest City to ensure that the local community, especially those in the Tanjung Kupang area, have roles to play in the development. The student above is from the first batch of students who started their Mandarin language course in August 2017 and has graduated. Forest City is not stopping there. Forest City’s master developer, Country Garden Pacificview Sdn Bhd (CGPV), aims to give back to the community by offering three-month basic Mandarin language courses to some 100 school children there. CGPV plans to continue to offer the Mandarin courses in the future as part of its corporate social responsibility effort for the community here. “The second intake will be conducted from January until March next year,” Country Garden Pacificview Sdn Bhd corporate communications head Aeron Munajat told reporters when met at SK Tanjong Adang here today where she handed over certificates to the participants. Aeron said that apart from learning Mandarin as a third language, the three-month language course will also help the students develop self-confidence which will further enhance their competitiveness in the job market in the future. She said the course involved students and teachers from five schools, namely SK Morni Pok, SK Tanjong Adang, SK Tiram Duku, SK Tanjung Kupang and SK Pendas Laut. “The classes are conducted every Friday and Saturday from 10am to 12 noon, at the community centre in Kampung Pok,” she added. The continued but futile attacks on Forest City by Malaysia’s Mugabe and his followers have again earned the ire of His Majesty The Sultan of Johor. “Has Johor ever pawned its land? What is the meaning of pawning? With Forest City, the state of Johor has increased in size. It is not about seizing land to be pawned. In Johor, there are international lots and Malay reserve land. Anyone can buy at the international zone, be it the Mat Salleh from England or people from India, Japan, China. All of them can purchase it. They can buy (property), but it does not mean they purchase the land to bring it back to their respective home country,” chided the Sultan. “In Johor, we have an international zone, which means that foreigners could buy. It has international status. In Forest City, we do not sell the land, we sell the strata (titles) and these strata (titles) are for permanent ownership in Johor,” he remarked. The Sultan added that 40 percent of the investors in Forest City are Malaysians and that even the government has shares in the project, and that the project gave a lot of revenue for the state government, including quit rent and assessment, which the state of Johor benefits. “How much revenue will the Johor government get? When Forest City is completed, the assessment, quit rent will go to who? Who will get the jobs? There are transportation (initiatives), businesses and job opportunities. Don’t be narrow minded about this,” said the Sultan. 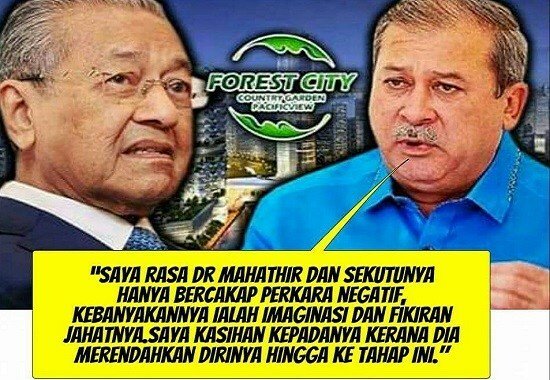 The Sultan also said that the most visible benefit of the Forest City project was the boost it has given to the value of real estate in its surrounding areas, particularly in Pontian district, which is now developing at a rapid pace. He gave an example of how in the past, the people of Pontian were only picking buah duku (lanzones), but now people in Pontian own Mercedes Benz cars. It is no doubt that Forest City will boost the Iskandar region’s marketability. With consumer prices 100 percent higher than in Malaysia, rent prices 500 percent higher than in Malaysia, many companies in Singapore were driven to relocate to Iskandar, while Johor Bahru’s shopping malls, food outlets and amusement parks have become a favourite for Singaporeans. Bangkok’s recent wish for Malaysia to extend its High Speed Rail into Thailand will soon make the Iskandar Econmic Region attractive to the millionaires and billionaires of Indochina. And the green, affordable buildings of Forest City will definitely be a hit. While they all win, the real winners will be the people of Johor and Malaysia.